What is Woof & Brew Ha-Pee Lawns Herbal Tonic? 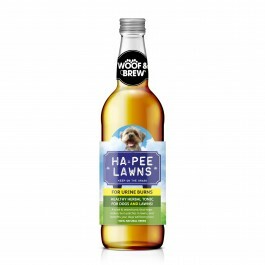 Woof & Brew Ha-Pee Lawns has been formulated to combat urine burn patches on lawns, as well as making sure it’s good for your dog too. Unlike many other lawn care products on the market, Woof & Brew’s tried and tested Ha-Pee Lawns blend is packed full of anti-oxidants, vitamins and minerals that benefit your dog, as well as neutralising the alkalinity of the dog’s urine. Urine contains high quantities of ammonia, which contains nitrogen. In the correct concentration, nitrogen is beneficial to plants and grass and is commonly found in fertilisers. Unfortunately, the concentration of nitrogen in Urine is very high, so the area of grass that receives the high doses of nitrogen dies, creating the brown burn patches. How does Ha-Pee Lawns work? Ha-Pee lawns is a specialised blend of herbs which offer specific benefits to both dogs and lawns. 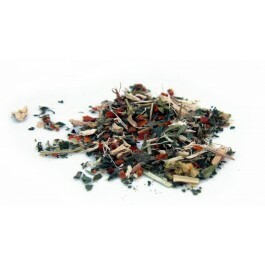 The herbs used in this blend help to neutralise the ammonia and nitrogen in dog’s urine, as well as providing cleansing and detoxifying properties that help to support your dog’s urine flow and the overall health of their urinary systems. How does each herb benefit my dog? Alfalfais rich in calcium, phosphorus, potassium and magnesium in addition to most vitamins and chlorophyll. This makes alfalfa a good detoxifier and blood purifier. Alfalfa particularly helps keep the urinary tract healthy and free of impurities. Yucca Roothelps to stop the burn patches on the lawn by neutralising the alkalinity of a dog’s urine. Tomato Flakesnot only add a pleasant taste to Ha-Pee lawns, the flakes also help to neutralise the ammonia in a dog’s urine – the primary cause of lawn burns. Marshmallow Rootsupports the urinary tract and its cleansing properties help to ensure a normal and healthy urine flow. Dandelionis rich in minerals and vitamins, and is also high in anti-oxidants. As well as supporting urine flow, these properties all help flush toxins and impurities from the body and urinary tract. Nettleis rich in vitamin C and many other powerful natural anti-oxidants. These act alongside the dandelion to have a gentle detoxing effect on the urinary system. Golden Rodis another herb with cleansing properties, helping to keep the urinary tract healthy and free of impurities. What are the benefits of using Woof & Brew Ha-Pee Lawns Herbal Tonic? What is in Woof & Brew Ha-Pee Lawns Herbal Tonic? Composition:Water-based infusion of Yucca Root, Marshmallow Root, Golden Rod, Dandelion, Tomato Flakes, Nettle & Alfalfa.